YOUNGSTOWN, Ohio - Sean Farrell (Hopkinton, Mass.) and Trevor Zegras (Bedford, N.Y.) scored twice while Matthew Beniers (Hingham, Mass.) and Matthew Boldy (Birmingham, Mich.) scored one apiece in the U.S. National Under-18s 5-2 win against the Youngstown Phantoms on Wednesday, Mar. 27 at Covelli Centre. The U18s record improves to 40-11-2-1 (W-L-OTL-SOL), while Team USA’s combined record in USHL play is 29-18-2-4. The Youngstown Phantoms’ record is now 31-19-1-4 (W-L-OTL-SOL). The game remained scoreless for the first ten minutes, despite multiple opportunities from either team. Cameron Rowe (Wilmette, Ill.) made a diving save at 5:11 to keep Youngstown off of the board. The Phantoms struck first with 8:45 remaining in the first frame when Riley Duran capitalized on a two-on-one opportunity. Ten seconds later, the U18s knotted the score at one. Zegras caught a stretch pass at the blueline from Domenick Fensore (Thornwood, N.Y.), sending the puck past Christian Stoever’s blocker side. The U18s extended its lead to 3-1 after two periods. At 3:13 of the second frame. Farrell sent the puck five-hole off of a rebound from Marshall Warren’s (Laurel Hollow, N.Y.) shot from the slot. With 4:15 remaining, Beniers gave the U18s a 3-1 lead. Beniers sent a wrist shot past the Phantoms goaltender off of a drop pass from Cam York (Anaheim Hills, Calif.). Farrell’s second goal of the game came with 48 seconds left in the second period when he scored short handed, with an assist from Patrick Moynihan (Millis, Mass.). Zegras netted his second goal of the game 50 seconds into the third period, snapping the puck under the crossbar off of an assist from Beniers. The Phantoms cut the U18’s lead to 5-2 with a goal at 6:38 of the final period. Nikolai Jensen was credited with the goal. Boldy sealed the 6-2 final score with a goal with 44 seconds left in the period to end the game. Rowe played a full game and made 17 saves in the win. NOTES: Team USA outshot Youngstown 32-19… Team USA was 1-for-3 on the power play and 4-for-4 on the penalty kill. 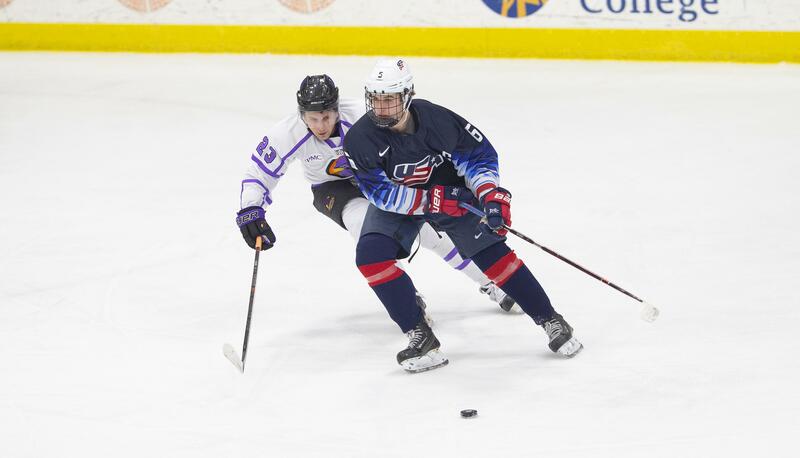 The U.S. National Under-18 Team returns to action on Saturday, Mar. 30, when it hosts the Youngstown Phantoms at USA Hockey Arena for its final home game of the season. Tickets for all home games can be purchased online at USAHockeyNTDP.com/Tix, by calling 734-453-6400, or visiting the box office.